Corruption allegations surrounding British firm Compass have been referred to the Serious Fraud Office (SFO). The United Nations suspended Compass last month after allegations of contract bidding irregularities. The firm subsequently sacked three staff. The SFO said it was conducting a statutory initial assessment of reports it had received regarding Compass. It will decide at a later date whether it has grounds to proceed with a formal investigation. The world's biggest caterer dismissed a senior executive last month following an investigation into how UN contracts were awarded. Peter Harris, the boss of the company's UK & Ireland, Middle East and Africa division, and two other employees involved with UN contracting were removed. The SFO emphasised that it was bound by law to vet the information it had received and had not launched a formal investigation. "The SFO has a duty to record and consider reports of possible overseas corruption involving UK persons and/or corporate entities," the SFO said in a statement. "Consequently we have noted the reports concerning Compass and will, in due course, come to a view." In a statement, Compass stressed that no formal SFO investigation was under way, noting that the SFO's actions were "normal and standard practice". The UN looked into claims that Compass division Eurest Support Services (ESS) had improperly obtained information on a $62m (£35m) contract to supply UN peacekeepers in Liberia with food and water. As a result, Compass brought in law firm Freshfields to investigate the relationship between ESS and the UN and suspended Mr Harris. 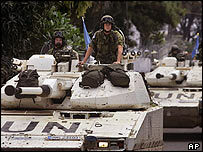 The food group supplies meals to some 30,000 UN peacekeepers stationed in such places as Kosovo and East Timor.